Cage dive with Great White Sharks and witness the speed, power and size of these magnificent predators in their natural environment. Experience the thrill of being underwater and surrounded by Great White Sharks! Feel the exposure of free-diving while remaining completely safe inside the cage, or remain on the boat and see the Great White Shark in all its magnificence from the surface of the water. Cage dive with Great White Sharks in their natural environment and experience the speed and power of this apex predator up close. Guests arrive at least one-hour before boat launch departure time. You will be required to complete the necessary indemnity forms followed by a hearty breakfast. This is followed by a safety briefing with our tour guide after which our boat departs from the harbour to look for the sharks on a 20 minute boat trip out to Shark Alley (in Winter) or a 10-15 minute trip out to the alternative viewing spot (in Summer) where most of the sharks usually hang out. 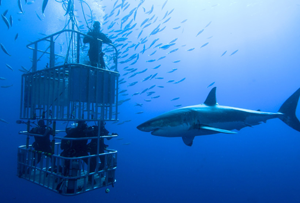 Divers can spend at least 20 minutes in the cage, unless shark sightings are really meagre, when time in the cage will be limited to give everyone an opportunity to see the sharks from the cage. We can only accommodate 20 people per trip, an advantage in the reduction of waiting time before and after dives. When everyone is satisfied with their viewing and dives, we return to the harbour and Crew House for lunch and a viewing of the video taken during the trip. This is also the time to purchase your copy before your departure. Time at sea ranges from 3-5 hours and all diving equipment is included. Door to door luxury air conditioned transport is available at R500. 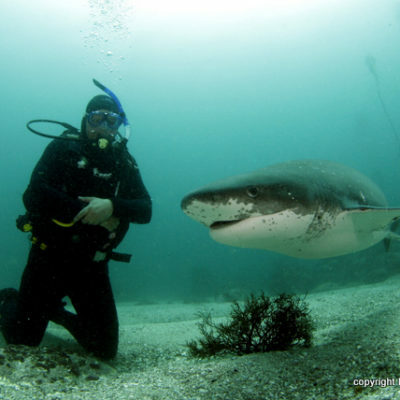 Shark Cage Diving tour buses travel daily between Gansbaai and Cape Town. 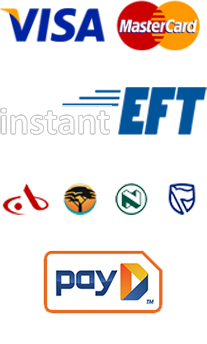 We can also pick you up in various destinations such as Hermanus, Somerset West, Gordon’s Bay, throughout the Cape Peninsula as far south as Simon’s Town, the Cape Town City CBD and surrounding Cape Town areas. 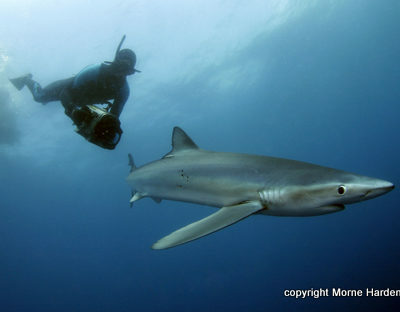 Book your shark diving experience now to witness these magnificent creatures and contribute to their conservation.